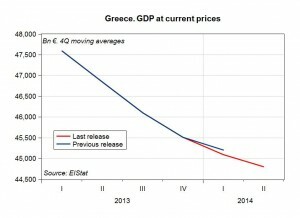 Both the International Monetary Fund (IMF) and the European Commission (EC), in their assessments of the performance of the Greek economy, appear more optimistic on the future of Greece because of the deceleration of the negative growth and a very slight decline of the unemployment rate, even though this was due to using statistics based on the new census that has resulted in demographic adjustments, and not due to growth in employment. An artificial positive sign on Greece that indicates nothing about Greece’s economic condition, yet it was celebrated as a sign of recovery, was the primary budget surplus and “going back to the financial markets” for a new issue of bonds. The budget surplus was achieved at the cost of creating many damaged lives. On the other hand, going back to the markets was purely a public relations exercise, since the interest cost of almost 5 percent of the new bonds was much higher than that paid on the bailout funds. Moreover, the bonds were implicitly guaranteed by the ECB because they could be used as collateral to the ECB for lower-cost bank borrowing. Finally, the demand for these bonds reflected the current state of excess global liquidity available and not because investors considered Greek bonds as a good risk. The latter is in concert with the well-known adage in Wall Street that at times of “excess liquidity, even turkeys can fly.” All in all, even if the economy were to have hit bottom, this does not necessarily mean it is out of the woods and to a better outlook for its future. Greek banks remain fragile and undercapitalized, thus unable to help the economy recover. A recent Levy Economics Institute publication strongly endorses co-operative banking for Greece as a much-needed alternative financing model for start‐up and existing small enterprises and as an all-important poverty policy alternative. Does the American experience with co-operative banking support this recommendation for Greece? In the United States, there are no co-operative banks per se. There are what we call Credit Unions and Community Development Banks. Credit Unions have been established throughout the United States and are very successful and mostly unaffected by the subprime financial crisis of 2007-09. They were originally established to serve customers who possessed some common characteristic, i.e. employees of a large organization such as the UN, or big business – IBM – or a locality, Hudson Valley in upstate New York and so on. By now depositors do not need to share a common characteristic. The present credit unions are not very big and serve their local customers since they are geographically focused. Community development banks are very similar and provide banking services to individuals and businesses with limited credit history, such as start-up businesses, firms in agricultural and remote regions, or to inner cities that big banks do not find it profitable to extend their services to. They are doing quite well serving the interests of the unbanked. Co-operative banks are mostly a European phenomenon and some have become very important in their respective countries and quite large. Others continue their mission of providing services, especially depository and lending functions, to people and areas that large banks shy away from. The most successful are in Germany. There is serious interest from these German co-operative banks to establish their model and operation in Greece. We don’t really need them. We can establish the Greek co-operative bank system very much different than the one we now have, which did not perform well all the time. Our proposal for cooperative banking in Greece incorporates a strong regulatory and supervisory structure, fully transparent, guided by a strong and professional board that will serve the liquidity needs not in the form of “red loans” (κόκκιναδάνεια), but to promote regional entrepreneurship. These banks would contribute to restarting the engine of economic growth, especially within the European framework of the social economy. It has been shown that the large systemic banks in Greece are still in the process of strengthening their balance sheets and have created the credit crunch I mentioned earlier. Dimitri Papadimitriou, after noting the ongoing failure of austerity policies in Greece, shares the results of a recent study led by Rania Antonopoulos on the effects of implementing direct job creation programs of various sizes in the beleaguered country. In one scenario, a 300,000-job program (in the low-to-medium-sized range of the policy options examined) would have reduced the ranks of the unemployed, once the likely multiplier effects are taken into account, by 30 percent if the program had been implemented in 2012, and GDP would have been increased by 4 percent. And the cost? 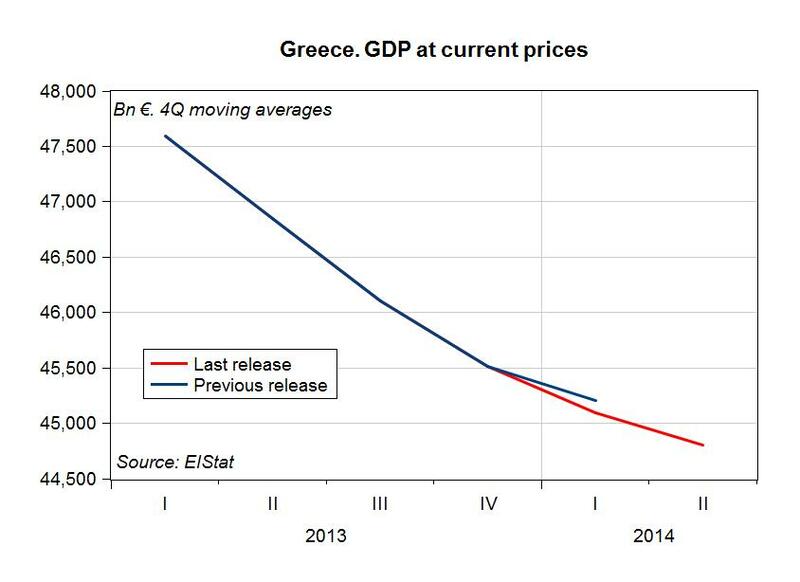 To run this impressive game-changer, Greece would have to net spend a little over 1 percent of its GDP. That’s a relatively modest stimulus. Other nations, when faced with hard times that didn’t come close to the distress in Greece today, have launched stimulus programs that were far larger. Germany and Brazil invested 4 percent of GDP, the U.S. 5 percent, and China invested 13 percent of GDP. The program could feasibly be funded by a dedicated EU employment fund, the issuance of special-purpose tax-backed zero coupon bonds, or a temporary suspension of sovereign debt interest payments. Even if the government borrowed the funds, the debt-to-GDP ratio, the measure of health most important to European leadership and financial markets, would improve. In case you didn’t catch that: investing in a direct job creation program of this size, even if it were funded by increased borrowing (not the best approach, according the authors), would still actually reduce the size of Greece’s public debt relative to its economy — something troika policy has so far failed to accomplish — because the economy would be growing faster than the debt. And the bigger the program, the greater the debt-ratio-reduction effect: had Greece implemented a 550,000-job program in 2012, its debt-to-GDP ratio would have declined by 9 percentage points — all in the course of reducing unemployment in Greece by nearly two-thirds. Read the rest of Papadimitriou’s article here. Update: see here for the complete conference schedule. There is still time to register for our upcoming Post Keynesian conference at the University of Missouri-Kansas City. Unfortunately, the program is full so we cannot accept paper proposals. However, there is still space for participants. Described as “the guru to wall street gurus,” Dr. Bruce Greenwald, the Robert Heilbrunn Professorship of Finance and Asset Management at Columbia Business School will kick off the event with a pre-conference lecture on “Value Investing and the Mismeasure of Modern Portfolio Theory,” Wednesday September 24th, 6pm. His lecture is free and is open to the public. What Should We Have Learned from the Global Crisis (But Failed To Learn)? ElStat, the Greek statistical institute, has recently published a flash estimate for GDP in the second quarter of 2014. In current euro prices, GDP keeps falling by 2.5% against the same quarter of 2013. We already know many will claim this as a success of the austerity plans, since the fall is now slower than in previous quarters … but output is still falling. It is also interesting to note that the flash estimate has also revised GDP in the first quarter of 2014, lowering it by 1% against the previous GDP estimate (see chart). The revision is larger on the current price GDP, against constant price GDP, which implies that the new estimate of the fall in prices is larger than it was. What will happen about fiscal policy after the tumultuous events beginning in 2010 or so in Europe and the end of Great-recession-era fiscal stimulus in the US? In the US, Paul Krugman and other economists debate the meaning of the CBO’s recent fiscal report, which, as Krugman points out, clearly show a drastic fall in the US deficit—to less than 3 percent of GDP at last check. This brings us to the main subject of our post: an interesting article that seems to be out in the July issue of the Cambridge Journal of Economics (abstract—rather technical). I happened to run across this new study last week. It may be one of those cases in which an academic article has some implications for macro policy. The authors consider an inflation-targeting fiscal rule: they explore the outcome when government spending is always adjusted upward or downward, depending upon the actual inflation rate, according to an algorithm of sorts set in advance. Before I go on, I should note the disclaimer that a paper of my own featuring fiscal targets also appeared last month in Metroeconomica, an international journal whose chief editors are based in Austria and Italy. I argue in the paper against deficit targets that restrict spending levels without regard to the strength of the economy. This notion that fiscal policy should aim for budget balance rather than good economic performance is the “Treasury view” lambasted, by the way, in another article in the same journal, penned by Suzanne Konzelman. I will try to outline the article on fiscal targets in terms of what I found in the process of working on my own paper. The post also includes an interactive model of how the rule in my own paper would work in a simplified version of the economy. I am happy to see various parallels and hope the new piece is indicative of widespread interest in output-stabilizing policy rules, or at least non-austerity rules, and in stock-flow-consistent macro models, including the Levy Institute macro model. The differences between the policy rules and other assumptions in the two papers are numerous. Most importantly perhaps, Matthew Greenwood-Nimmo, the author of the new CJE article, considers a different type of rule. An inflation-targeting rule is the main fiscal policy rule considered in the paper. Inflation-targeting is certainly run-of-the-mill for monetary policy around the world, but as this IMF country-by-country list of fiscal rules now in force indicates, most actual rules simply specify low deficits or low ratios of the budget deficit to GDP. Specifically, Godley and Lavoie’s rule–published years ago in the Journal of Post Keynesian Economics and reprinted in 2012 and in a collection of papers by Godley —called for a level of government spending that would immediately fill the gap between actual and potential output—and hopefully keep unemployment low. In contrast, Greenwood-Nimmo adopts a rule with spending changes in specific amounts that go into force abruptly once inflation exceeds or drops below certain upper and lower bounds or thresholds. Can a Euro Treasury End the Crisis? It was only a matter of time until the euro area was hit with the kind of crisis from which it is still struggling to recover—this was understood well in advance, by many at the Levy Institute and elsewhere. The problem has always stemmed from a structural weakness in the design of the currency union: member-states gave up control over their own currencies but retained responsibility for fiscal policy. This situation rendered them subject to sovereign debt runs—which occurred when the fallout from a banking crisis fell squarely on euro area national treasuries—of the sort that countries controlling their own currencies do not face. As we have pointed out previously, member-states are in some ways in the same situation as US states, which are forced to cut back when the economy contracts—that is to say, at the very moment when expanded public spending is required to place a floor under the economic collapse. But US states have the benefit of a treasury at the federal level that can spend without the same sovereign debt concerns (which the US federal government did, briefly, before succumbing in 2010 to a misguided notion of “fiscal responsibility,” not to mention congressional obstruction). The eurozone member-states, however, do not have the benefit of this treasury–central bank combination at the level of the central government—a lacuna Jörg Bibow addresses with the proposal outlined in this policy brief. Thank heaven for Tom Hoenig, the only proven-honest central banker we’ve got. Yes, I know he’s moved on from the KC Fed to serve as Vice Chairman of the FDIC. He actually might do a lot more good over there, anyway. In recent months, we’ve heard how Wall Street’s Blood-sucking Vampire Squids have reformed themselves. They no longer pose any danger to our economy. They’ve written “living wills” that describe how they’ll safely bury themselves without Uncle Sam’s help next time they implode. You see, it doesn’t matter that they remain big—indeed, the biggest behemoths are much bigger than they were before they caused the last Global Financial Crisis. They are no longer “too big to fail” because they’ve all got plans to unwind their dangerous positions when stuff hits the fan. This is very important to Wall Street and Washington because Dodd-Frank requires downsizing and simplification of the Vampire Squids if they remain a threat. Big financial institutions that are highly interconnected can cause a relatively small problem with one bank’s assets to snowball into a national and international crisis that forces Uncle Sam to intervene to bail-out the miscreants. We know that the biggest half-dozen US banks are huge and have highly interconnected balance sheets. We know they have legacy garbage on their balance sheets, and they are creating massive quantities of new trashy assets every day they remain open. That’s their business model. They love that model because it enriches a handful of top management at each institution. As Bill Black says, these are run as control frauds—their motto is “Frauds R Us.” Nearly every day one of them gets caught red-handed in yet another fraud. They pay peanuts in fines and go about their fraudulent business. Nice work if you can get it. So it is critical that each of these demonstrate it has a way to disconnect its balance sheet from the others as it oversees its own demise. Otherwise, these institutions would have to be downsized and their frauds curtailed. When the European Union (EU) and the International Monetary Fund (IMF) came to Greece’s rescue in May 2010 with a 110 billion euro bailout loan in order to avoid the default of a eurozone member state (a second bailout loan worth 130 billion euros was activated in March 2012), the intentions of the rescue plan were multifold. First, the EU-IMF duo (with the IMF in the role of junior partner) wanted to protect the interests of the foreign banks and the financial institutions that had loaned Greece billions of euros. Greece’s gross foreign debt amounted to over 410 billion euros by the end of 2009, so a default would have led to substantial losses for foreign banks and bondholders, but also to the collapse of the Greek banking system itself, as the European Central Bank (ECB) would be obliged in such an event to refuse to fund Greek banks.